Garden shed and garage are often used but seldom left aside when home cleaning. Start organising your reliable storage rooms now with this complete guide. Fond of your storage spaces? 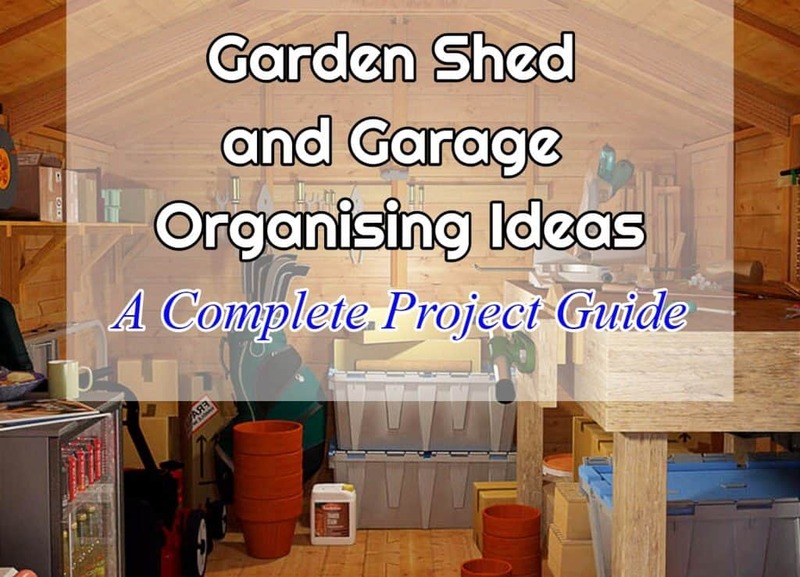 Not until you realise what a pile of mess your garden storage shed or garage have become. 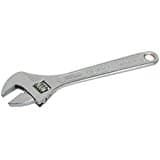 Things get awfully stressful when you are in dire need of a rake or screw but would have to rummage through the chaos of tools and boxes to find what you’re looking for. If only there’s a better way to keep the mess at bay. It’s not an easy task, but it’s not something you can avoid either—that is if you intend to keep your home safe and the family safer. Also, those clutter has to be sorted out to help you reclaim or increase the storage space to stock in more important things. Not to mention that the cold season is slowly creeping in. 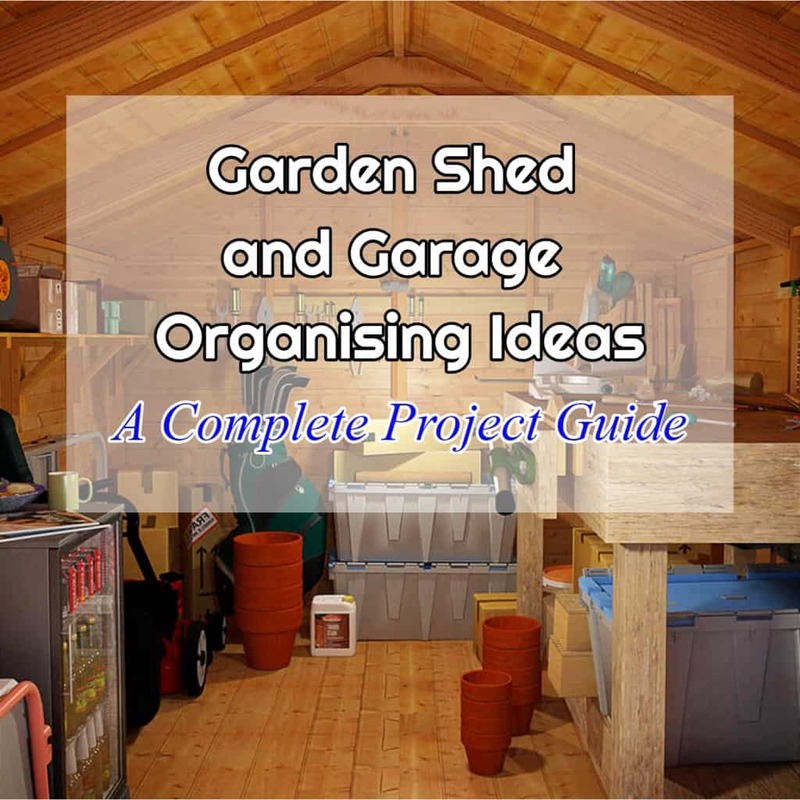 So to help you get on with your shed and garage project, we’ve compiled as much practical and creative ideas as you will need in decluttering and organising storage spaces. 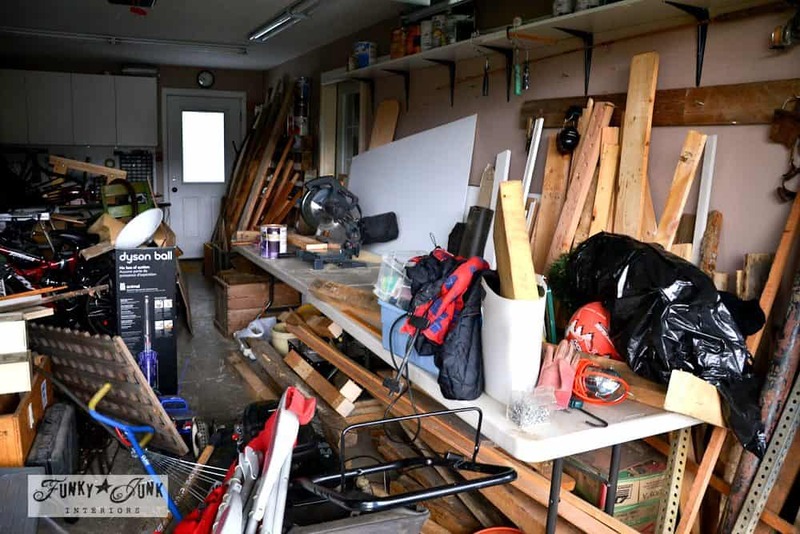 Why is my shed or garage cluttered, anyway? 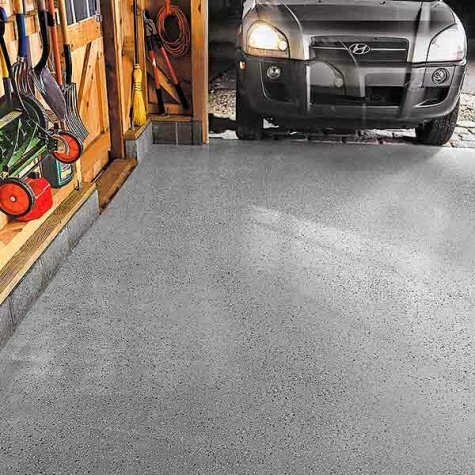 The garage and outdoor shed are basically meant for keeping in things you don’t always (or ever) need inside your house. 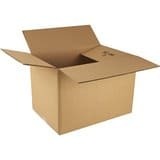 And with much storage available in every UK home, it’s so easy to dump in items and leave the sorting out in the future. Perhaps you meant to retrieve those stuff in case you need them? But in most cases, it happens only after another whole year past. Think bicycles or toys for the visiting kids or BBQ for your outdoor summer party. Or it could be you’ve been meaning to clear your messy spaces but just couldn’t bear to throw away worn-out furniture or rusty tools. Why? Sentimental reasons. If this sounds anything like you, don’t worry, you’re not alone. 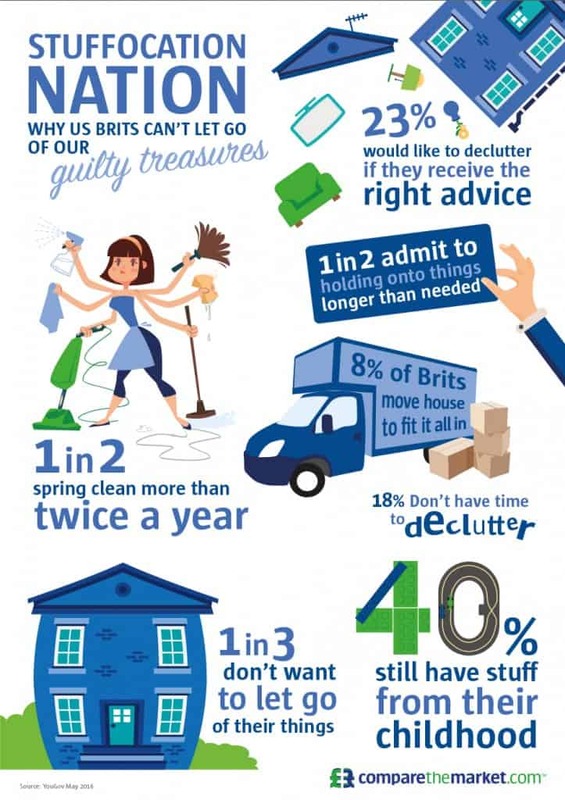 A 2016 research found that 1 in 2 Brits admit to holding onto things longer than they should and a significant 8% end up with so much clutter that they move to a bigger house. Needless to say, clearing out stuff is a family and personal issue you can deal with in no time. 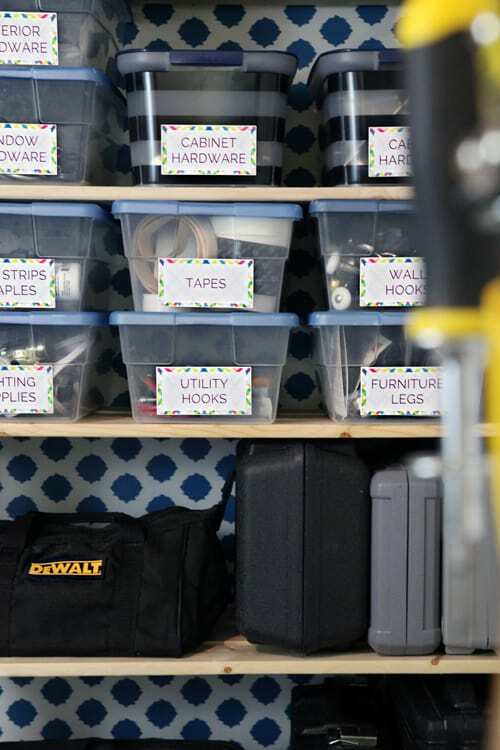 How will you begin organising your storage space? With the so many stuff to sort out, you get too overwhelmed to even start the decluttering work. But that’s the thing with clutter. So your first bet in clearing out is to be brave enough to tackle on the large mound of stored items. 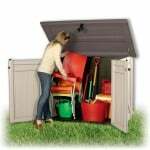 Purchasing outdoor storage may be a good start. Now that you’ve found your motivation, have the others join in. After all, more hands are better than one. And with a home project as big as a wooden garden building or parking space, any help will be much appreciated. Plus, involving the family and any user of a storage area allows them to participate in the decision-making process. They get to evaluate their needs and choose what stuff to keep. A drawer may be trivial to dad but valuable to mum and a stock of pallet may be rubbish to the kids but a treasure to dad. 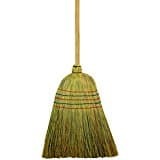 Not only will this help hasten the work but also keep the peace when things have been thrown away. Before you all get down to business, take the time to systemise. 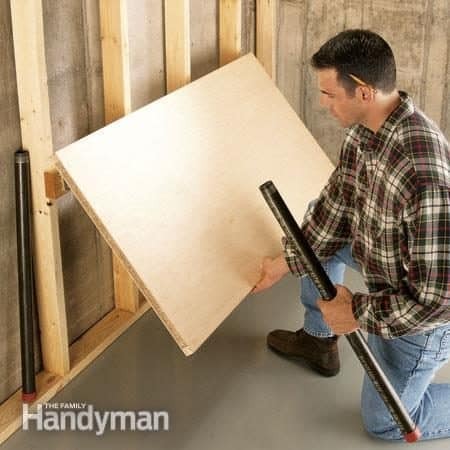 If your storage shed or garage is too big or the mess is scarily huge, then break the job into smaller tasks. 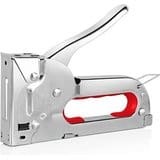 You could dedicate your first cleaning effort to an overladen wall on the one side of the room, then the next wall, then the heavily blocked floors. 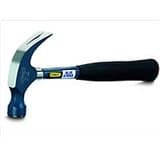 Or you can start tackling down a set of big equipment or tools before the smaller ones. You can also decide on making a category of items into for keeps, relocate, trash or donate. This way, you cut down the time for when you’re arranging things back into order or getting rid of it forever. set a target or time to get everything done. This is especially helpful when children are involved. You can even have a reward system, making the job more fun and rewarding for everyone. Whichever works for you, having a plan or system of doing things can surprisingly ease up a difficult job. If you’re serious about being neat and clean with your stuff, it’s best to ensure that your storage space is free from any waste and damage. How to do it? 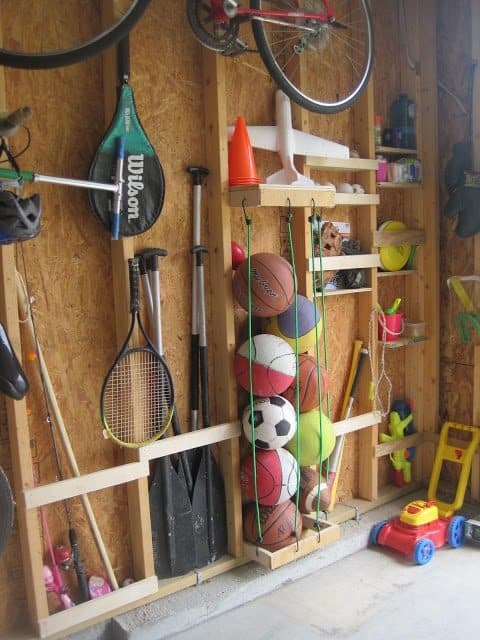 Empty your shed or garage from all the stuff. Very much daunting, yes, but there’s no better way to get your storage and valuable items cleaned and better organised. 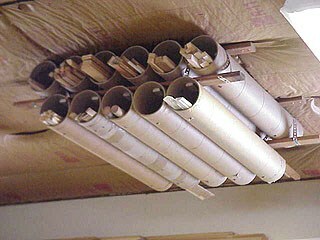 It would also be much time-saving when you have categorised the items as you empty them out of the structure. Check your shed or garage for any damage. Wooden sheds are prone to leaks and termites so see if there are such problems to address. Metal sheds or garage structures, on the other hand, may have rusted or corroded areas to deal with. Apply all the necessary treatments and repair. Give your storage a general cleanup by pulling down spider webs, sweeping every corner and spaces or hosing down the whole structure. Allow it dry before doing anything else. 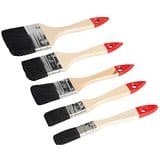 If you plan a big makeover, you can even repaint or redecorate for a nice finish. Already decided on which items to store in back? 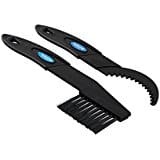 Then clean them up too of any dirt or repair whatever damage it incurred from being stashed way too long. Be cautious when it comes to chemicals. As much as possible, keep them farther from your house, but if you are to store them in garages or sheds, make sure to seal their containers and make the labels legible. Getting past the clean up is a welcoming achievement, however, organising is a very different thing. In fact, organisational skill is not something everyone has or good at. But did you know there are systems for systematising things around? An order expert recommends grouping like items together in terms of size, weight, accessibility, use, design and 35 other ways. When it comes to storages, experts and homeowners offer wide and varied suggestions to help you reclaim your space. And all of it boils down to this: Store things efficiently. 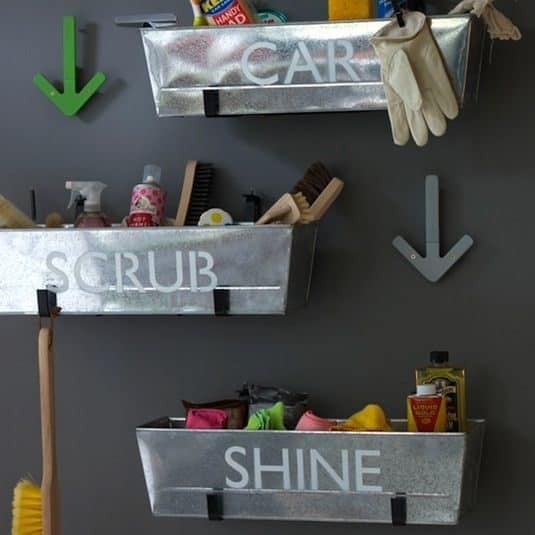 The idea of organising is to make full and better use of every corner of a storage space. 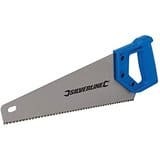 This will lead not only to a functional garage or shed but to a stylish room as well. Love the idea? 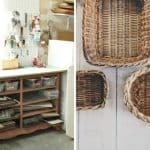 Then turn those forgotten spaces into a home and garden centrepiece with these practical organising methods you can steal from. Starting off with the seldom given attention storage area, the ceiling. It doesn’t seem like a normal place to store stuff but with some carpentry work and creativity, ceilings are big utilities. That air space on your ceiling can be filled in with stuff. 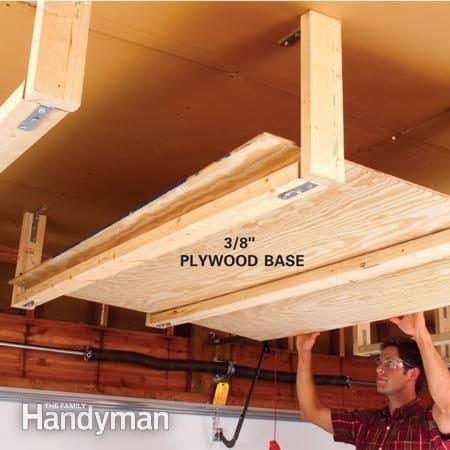 Use wood and plyboards or ready-made plastic racks as your suspended rack and drill them into the ceiling. 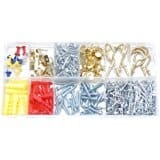 When done, you can arrange your plastic storage boxes neatly into the rack. 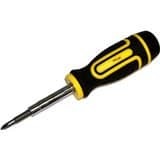 Be mindful of the weight; store in light tools or equipment that you don’t use regularly. For detailed instruction, see the Family Handyman. If overhead racks seem like tedious, try a simple sliding system. 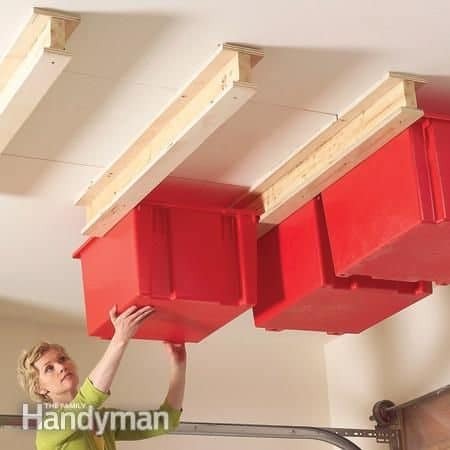 This will take only a few plywood strips and reinforced plastic totes to create a carriage for storage boxes up on your ceiling. 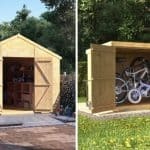 Don’t have a bike shed? 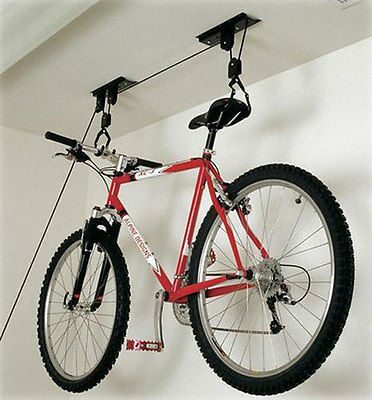 This system makes a wonderful suspended bike storage solution. Its pulley system works like blinds – pull on the rope to raise the bike and lock it in for safety then loosen the rope to lower. 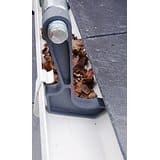 You’ll need a rigid plastic pipe like water pipes or large cardboard tubes to run along the length of the ceiling.Slot in here long narrow items such as garden cranes, wood trims, and pipes. 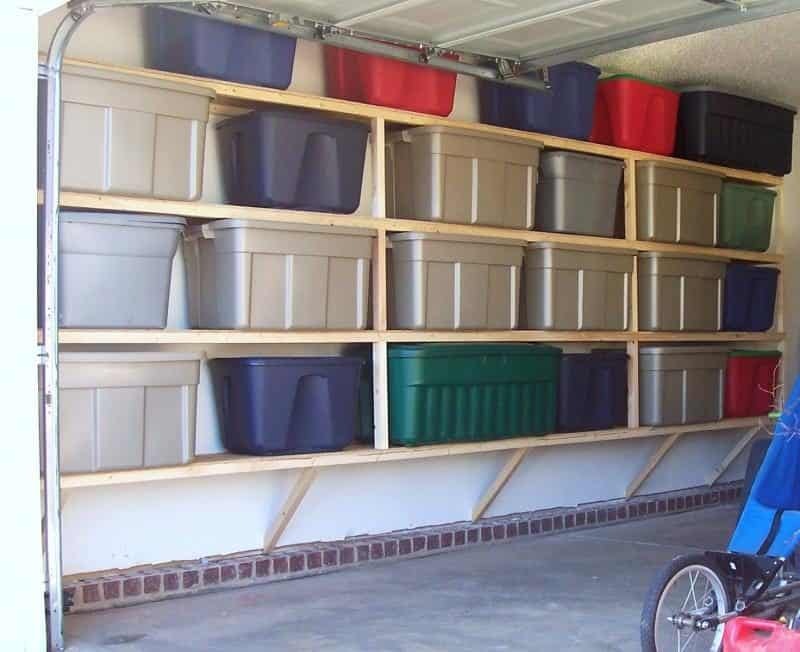 If there’s any part of your storage room or garage that fits perfectly as an efficient space saver, it’s the wall. From classic to modern, the wall has plenty of storage ideas to offer. An open shelf right on your wall allows you lift all those storage bins and garden and home accessories off the floor. You can install your own shelves using pallets or reuse those bookshelves. 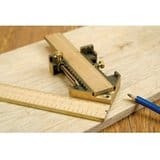 Organise anything in a board perforated with patterns of holes. 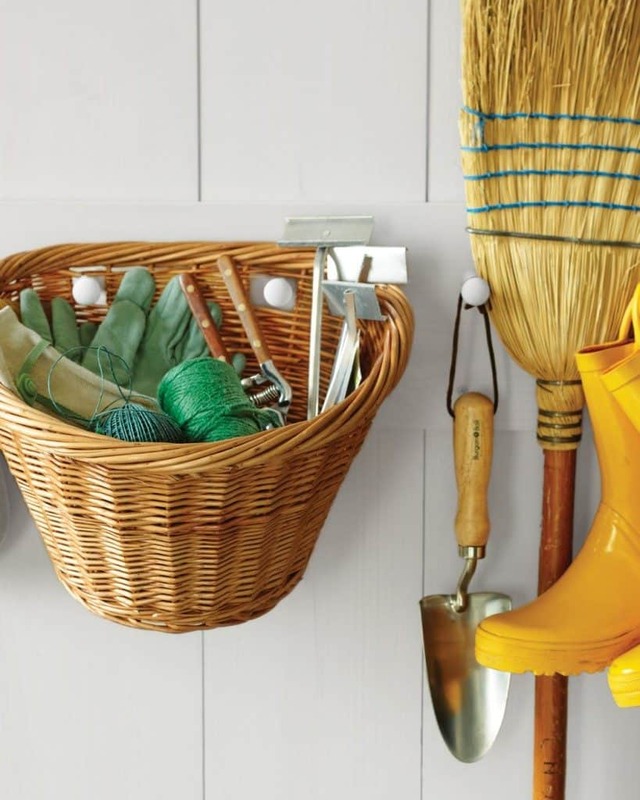 Here you can fit in hooks or pegs to hang garage and garden tools or baskets filled with accessories. 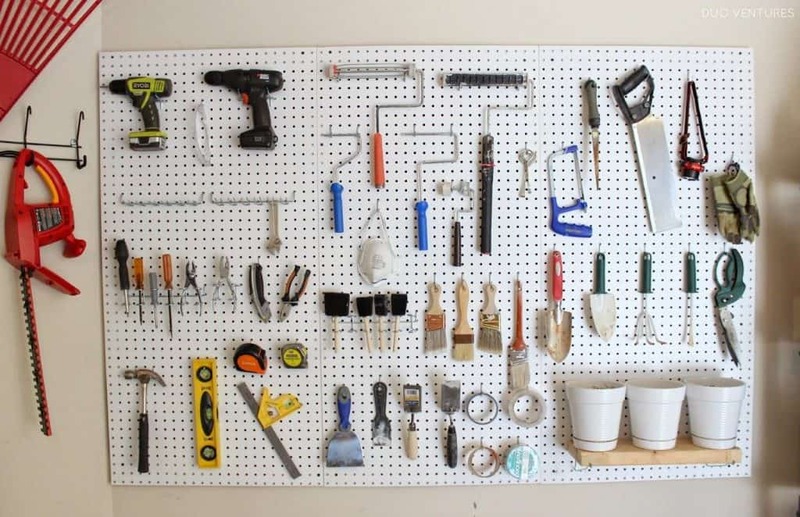 Discover how Martha Stewart makes a nice white pegboard organiser. 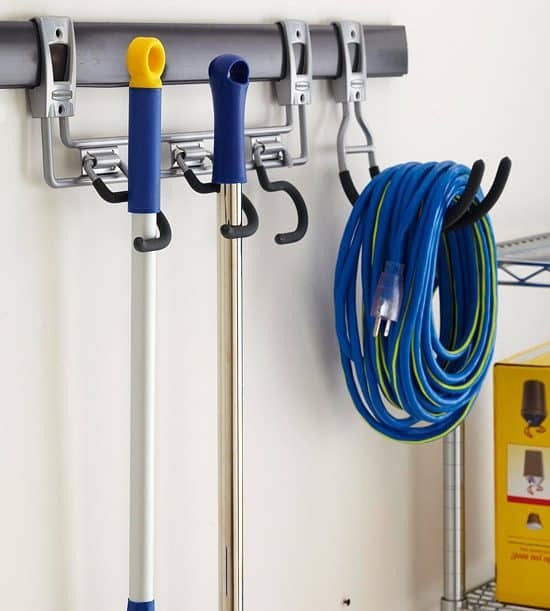 Hooks on wall mounted rails are nifty space savers and can be bought at a low price.They are perfect for keeping large tools in neat array, organise hoses and ropes and secure just about any items out of harm’s way. You can use those colourful bungee cords as storage too. Run the length of the cord either vertically or horizontally along the wall then hook both ends. Now you’ve given those balls a place to set in. Got unused towel holder from your bathroom? Use it as garbage bag dispenser instead. 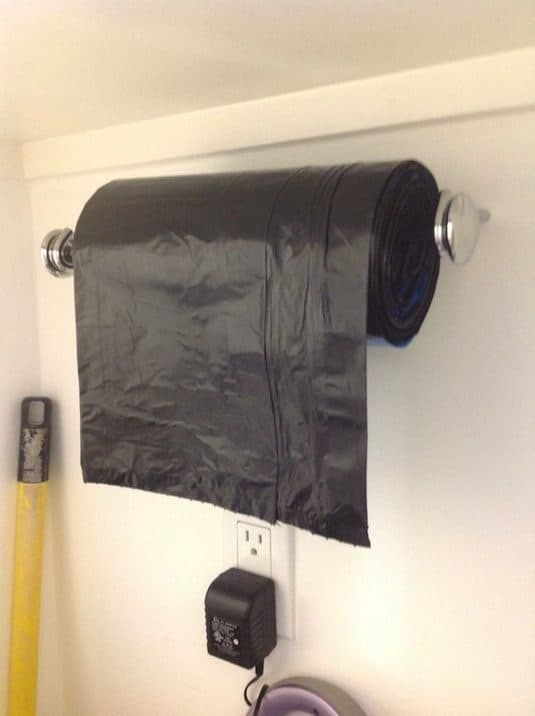 Secure the holder into the wall and slot in a narrow rod into the middle of your garbage bag. Steal this idea from the kitchen. 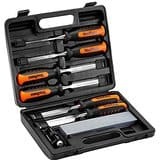 Magnetic tool racks or bars make the digging of metal tools from the drawer a thing of the past. 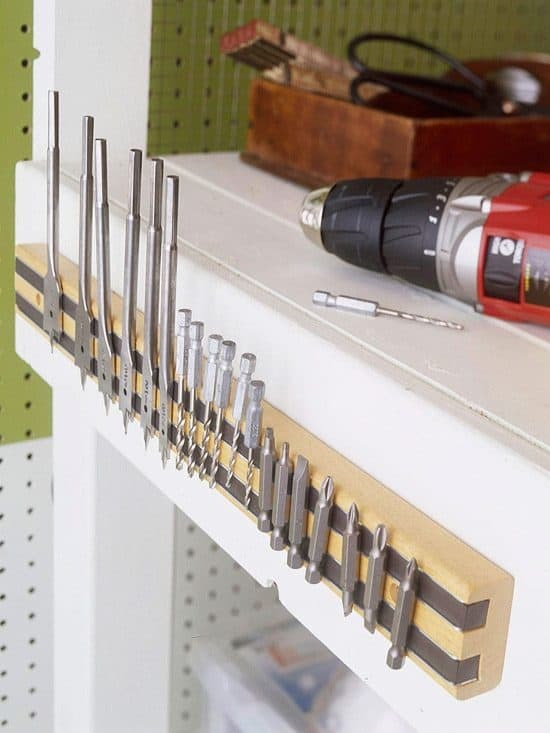 Nail or glue this magnetic racks into the wall or along the side of your workbench for easy reach. Screws, wrenches, nails, scissors are perfect here. Twines and strings can get a bit fuzzy if not kept properly. 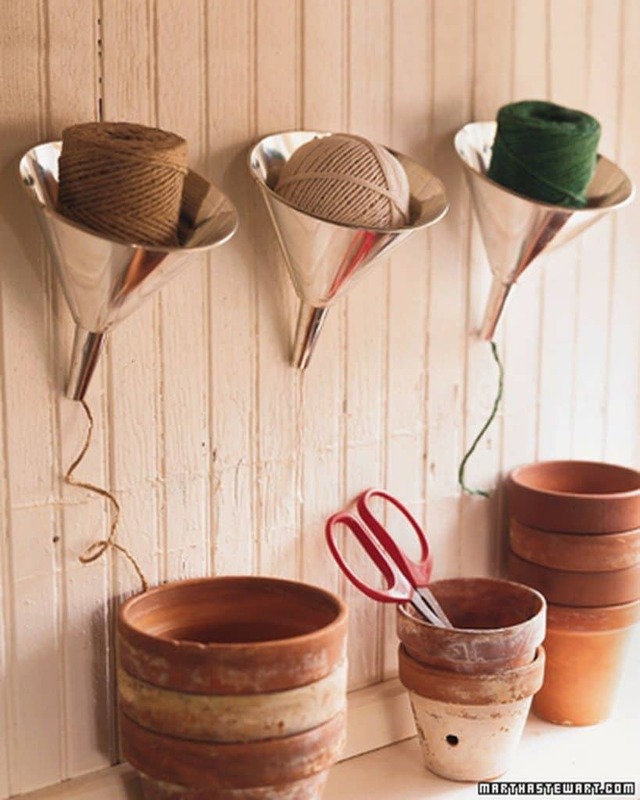 Dedicate an area of your wall to nail in aluminium funnels. Run a string into the spouts of the funnel and place the rest of the ball of strings into the wide opening of the funnel. Workbenches and tables use up a large chunk of floor space. So instead of bringing a fixed table, why not set up a foldable one on a wall. So when work’s done, you simply have to return all your working materials and the table back to their places. Yes, even the door hold a lot of space saving idea. 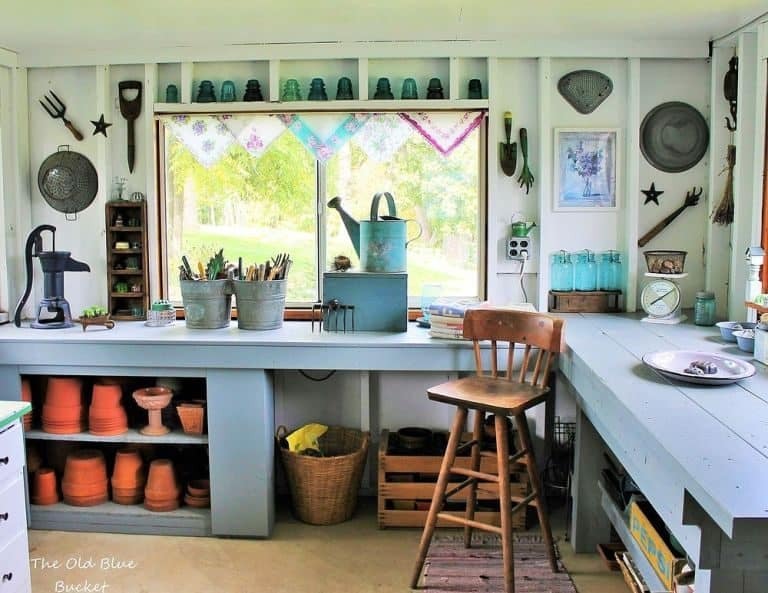 If you’re always on the go, baskets, tin cans, and small buckets hanging by the door make a charming go-to container.Place in your gloves, yarns, and any other garden essential. 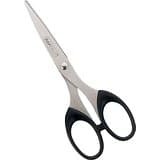 They come in different size, shape, material and even colour. Mason jars and cans can either be hanged on the wall or ceiling or fitted nicely on top of shelves or tables. 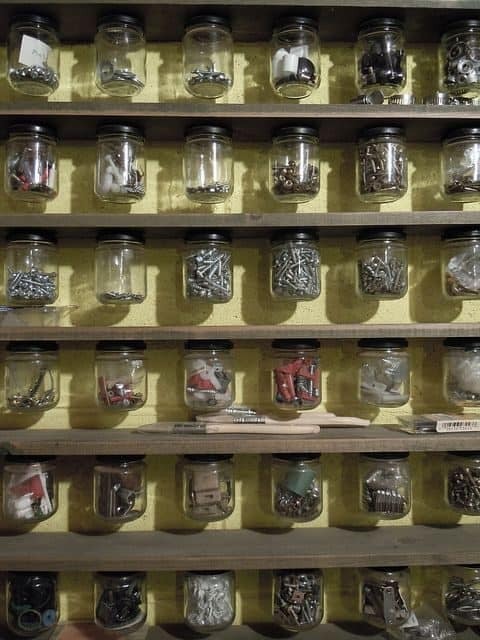 Just like their versatility, jars and cans store any sort of object from nails, screws, and even seeds. Get stylish with your cabinetry using crates or pallets. 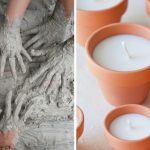 These are inexpensive materials you can find in flea markets or are just lying around your kitchen. 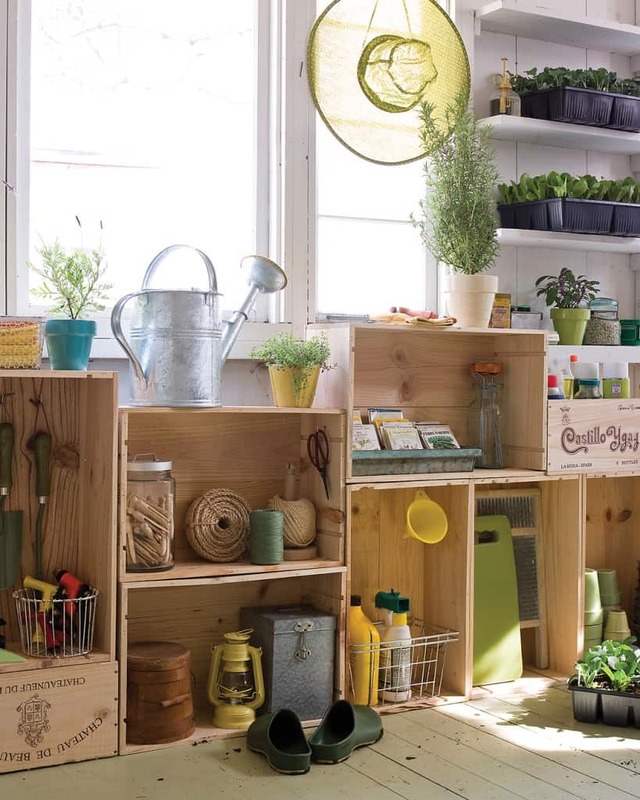 Stack them up in varying layouts near the wall and store all sorts of garden tools and equipment. Plus, you can add hooks inside the crate to hang in other accessories. Pipes make a great tool holder, too. 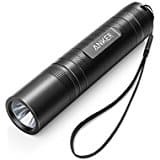 You may have something lying around the garage or shed or you can buy the cheapest ones in stores. 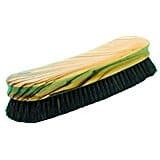 Use them as an upright yard tool holder for brooms, rakes and other long-handled items and corral them all together in a corner. 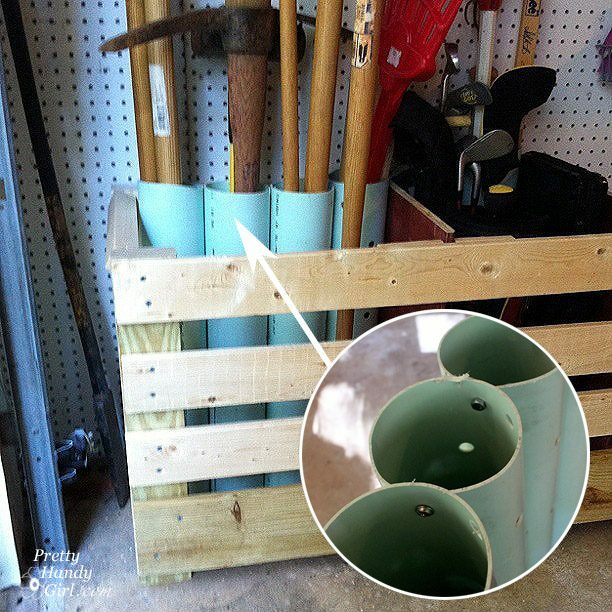 Got unused planters in your garden? 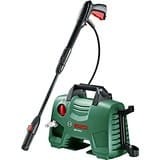 Keep them in your sheds or garage with a twist – as storage of your gardening supplies or cleaning materials. Mark each of your storage containers with name tags or labels to help ease the search for any item in your shed or garage. 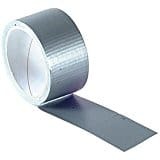 Don’t want to write labels? 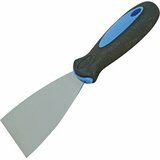 Draw them instead like this tool wall. 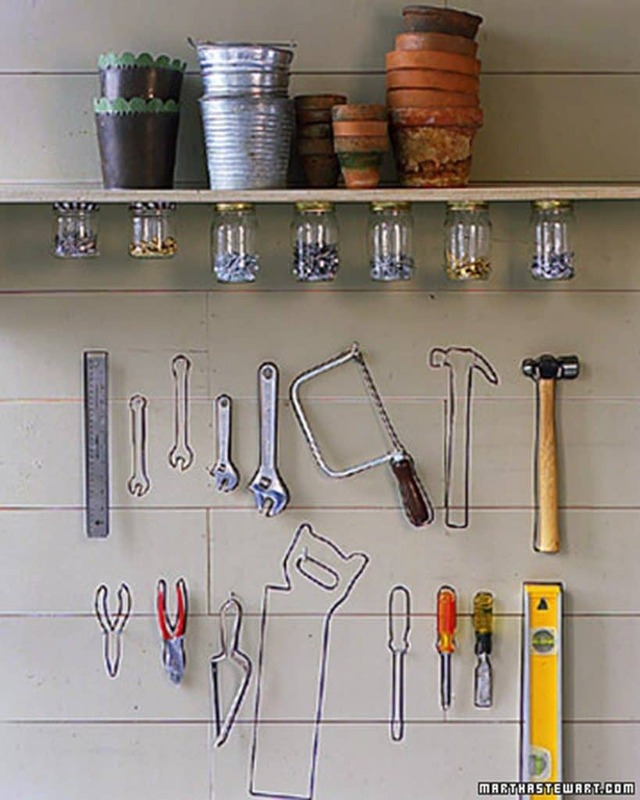 This way you’ll know where to get and keep each tool every time. 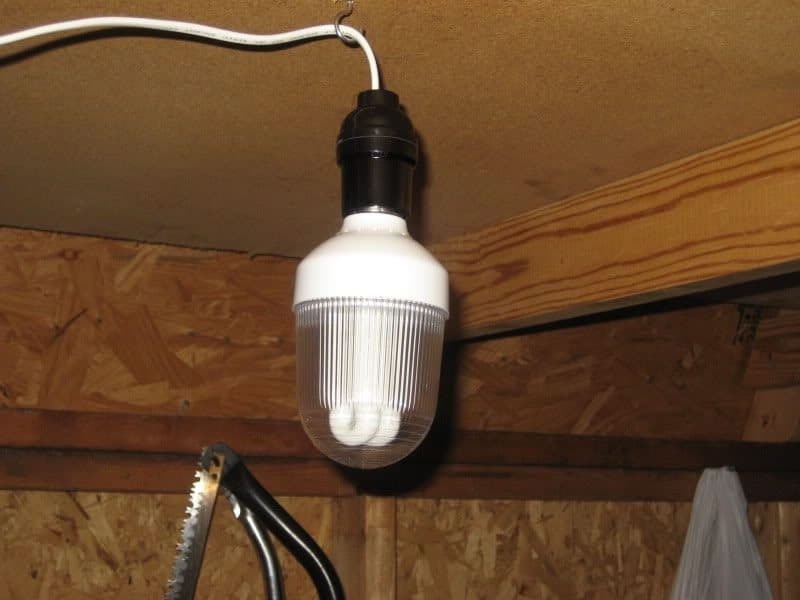 You may be leaving your garage or garden shed closed most of the time but having a good lighting system is a must. You may opt for energy-saving bulbs or invest in solar lights for longer use. Nothing beats a brightly coloured interior. Not only does it add cheerfulness into a room but makes working a lot more easy on the eye. 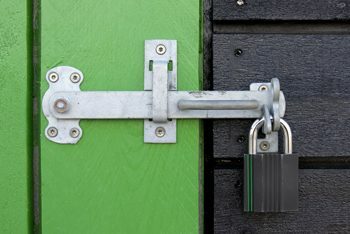 Your garage and shed are the storage of your valuable goods so never skimp on security. Invest in good locking system such as the police recommended home security. 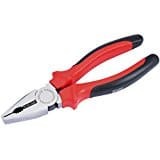 Always keep them closed even when you’re working around the garden or patio. Wooden sheds are most likely to suffer from condensation, what with the extreme UK weather. Insulating tackles this moisture problem upfront, plus it locks in the heat when the cold strikes outdoors. Here’s a quick video on how to insulate a wooden shed. 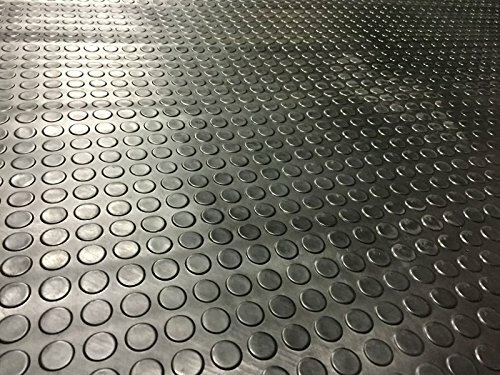 Maintain and waterproof the garage floor wisely using rubber coin floors. 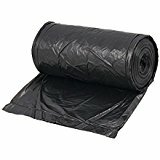 It comes in a thick material with various widths and lengths to fit your room. Or apply an epoxy coat for a nice clean floor finish. This type of coating resists oil stains ad allows for easy wiping or cleaning. Always be on alert. 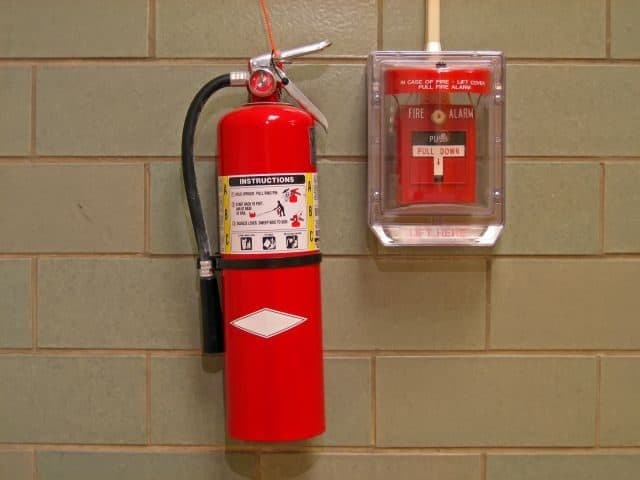 Keep emergency essentials like a fire extinguisher and floor plan inside your storage but make sure to place them out of pets’ and children’s reach. Waiting for the spring clean?Don’t let a season pass without wiping the storage boxes or lifting a broom once to clean your shed or garage. Include your storage spaces in your cleaning schedules each week or two to maintain the cleanliness after your overhaul.